In the list of hotels below, I have identified those at which I have stayed and those whose details have been given to me, but at which I have not stayed. Generally I find that if I stay somewhere where the staff speak English getting around/making arrangements is much easier. Wherever you stay just make sure that you have the hotel card with you at all times, it will usually have the hotel address/directions on it in Farsi – so any taxi can take you back. It may be worthwhile checking out the rooms/facilities before you actually sign-up and pay any deposits. Standards can vary from year to year and rates can vary depending on the season. I have now stayed in this hotel on three occasions and the experience every time has been good. The hotel is clean and the restaurants are nice and comfortable. I like the fact that it is not carpeted everywhere, much easier to keep clean. Also they do not overdo the curtains etc. There is also an internet connection. The hotel is conveniently close to the harram. Shahid Astaneparast Market, First of Tabarsi St. This hotel is opposite the Attrak hotel and is similarly conveniently located for the Harram and for the Imam Reza (a.s.) bazaar, which is recommended for souvenirs. I stayed here in 2002 and did not really enjoy the experience. Things do change, however. ASHRAUF SUITE & APARTMENT (OLD NAME BEHZIST) is good but if you can spend little more then REZWAN HOTEL is very good. Both are in same lane so can be checked at the same time. These are nearest to the Roza as they are behind it. KHIABAAN-E-TABARSI, FOROUZAN STREET, KOCHA-E-HOZ AMEER, MASHHAD. US$80 per night, 2 people sharing, incl breakfast and all taxes etc. (2008) same rate for one person alone. 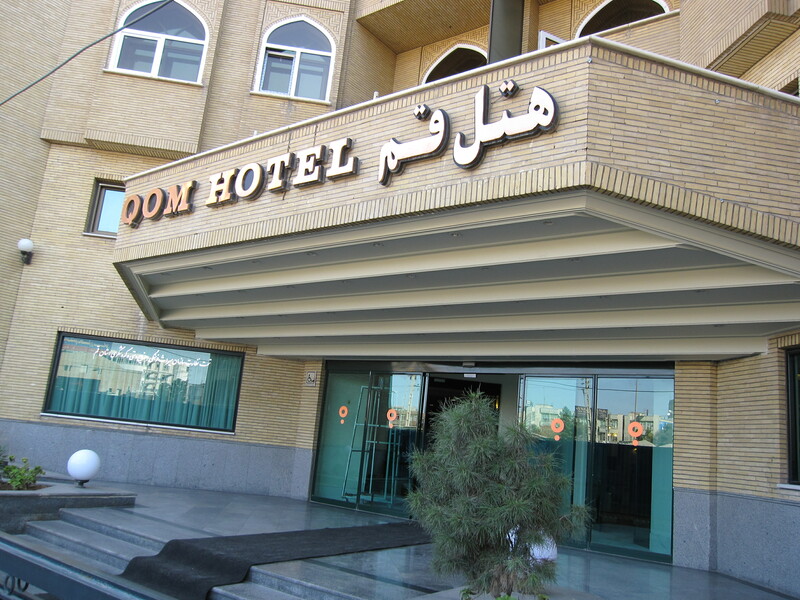 In Qom I've stayed at the Qom International hotel. This is relatively expensive, you will be looking to pay £40 per night (incl breakfast), but it is clean and well maintained and the staff speak good English. There is also a good internet connection. The restaurant is also nice, though you can get food cheaper outside. This hotel is relatively close to the harram and you won’t have to cross any roads (the drivers are suicidal). There is a taxi rank behind the hotel. Oppposite the front entrance of this hotel is a covered walkway, if you go over that and turn left you will see Khoja-Shia guest house on the other side of the street. This is far cheaper than the International Hotel. This is a musafirkhana, it is much cheaper than standard hotels, but can be very basic. This hotel is along the same road as the Arg Karimkhan Zand, the two are walking distance apart. The hotel is also not far, walking distance, from the two mosques I have mentioned in the photo albums. It is a short cab ride from Shah Cheragh. The hotel is neat and clean and the restaurant is also good. Overall the hotel is ok, but looking tired in places. There is internet access and the reception staff are very helpful. They speak English. While I was there a party of Dutch school kids were visiting. I had to go to the Homa hotel on one occasion in order to buy some airline tickets in the office next door. It was pretty clear that the Homa attracts the more moneyed elements of Iranian society. I don't think it would have been as convenient though. I stayed at this hotel in 2002 and it was fine. They charged US$50 per night per double bedroom then. It's not far from the old American Embassy. I would not recommend the hotel we stayed at in 2007 (it's called the Mashhad hotel). It was over-priced and our rooms were not very nice (perhaps because we asked for ones sleeping 3+ people) – but other rooms were ok. It’s about US$70 per night (incl. very basic breakfast, literally just bread, tea and jam). It is in a nice part of Tehran, opposite the Greek embassy (lots of international businessmen at the hotel). Nearest station is Taleghani. This is also where the old US Embassy used to be, now a museum.